Last week on The Trail, the five year-round Head Staff members shared their thoughts on what makes Camp Echo Lake such a special place. This week, we are proud to introduce you to the 2015 Head Counselors and the LIT Director. Below is a brief introduction to each person (listed in division order). To get to know more about any of the individuals profiled this week, click on their name to read more about them. 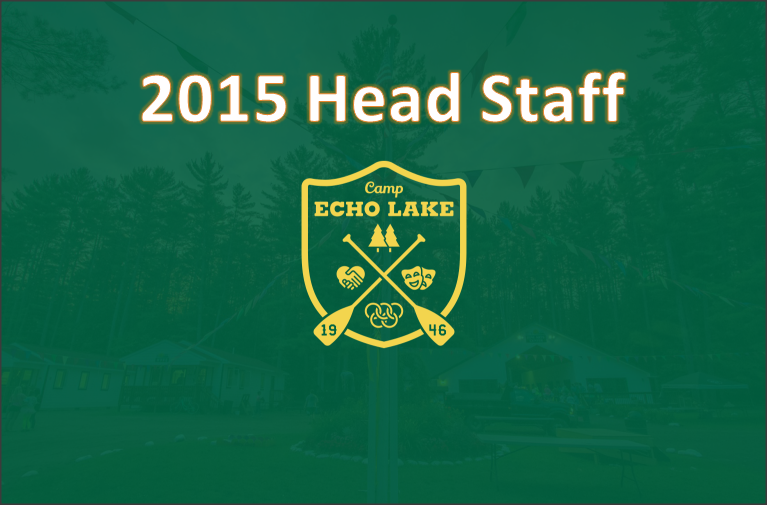 Patrick will be returning for his 10th summer at Camp Echo Lake, and his 5th as the Junior Boys Head Counselor. During the year, Patrick works as a third grade math and science teacher at Eagle Arts Academy in Florida, and also works on an iPad learning program called “BrainiApps” that he launched. From “glamping” to “ZAP Lemonade” and everything in between, Patrick brings a lot of creativity and passion to his role as the Junior Boys Head Counselor. Kelly will be returning for her 9th summer at Camp Echo Lake. During the year, Kelly works as a third grade teacher in Fayetteville, NC. Once again, Kelly will be joined by her rescued Beagle, Benny, this summer. She is looking forward to working with Ally Begly (Inter Girls Head Counselor) to creating an exciting environment for the girls of Main Village (especially at morning lineups). Kelly lives for her summers at Echo Lake, and admittedly brings parts of camp into her classroom to make the winter months more enjoyable. Matt will be returning for his 6th summer at Camp Echo Lake. Having recently earned his Master’s degree in Risk Management from the University of Western Ontario, Matt hopes to someday work in risk or organizational consulting. Matt looks forward to working closely with Patrick McNeece (Junior Boys Head Counselor) to create an fun atmosphere for the boys in Main Village. He is a big fan of “glamping” (which he co-created), and is excited for the return of Echomania this year. After a brief hiatus, Ally will be returning for her 17th summer at Camp Echo Lake. During the year, Ally teaches first, second and fifth grade science in Madison, WI. Ally is very excited to be returning to Echo Lake this summer, where she will work alongside her parents (Glenn and Terry) and her brother, Corey. While she particularly looks forward to morning lineups and Special Days, Ally also thrives upon the energy, enthusiasm and fun that each day at Echo Lake holds. Jon will be returning for his 8th summer at Camp Echo Lake. Although Jon never had the opportunity to be a camper in his native England, growing up watching Bug Juice gave him the desire to work at camp. During the year, Jon works full time at Camp Leaders (an international summer camp agency that provides staff for camps all over America). Thankfully, Camp Leaders gives Jon the summer off so that he can return to Echo Lake to “be a cog in the well-oiled machine” that makes up the Senior Village team. Kersti will be returning for her 5th summer at Camp Echo Lake. Working at Echo Lake has been a dream of Kersti’s since 2005, when her cousin worked at the camp and sent her postcards and letters about how much he enjoyed it. The one summer that Kersti spent at a desk job (since she started at Echo Lake in 2010) only reinforced how much she was meant to work at camp, and how she truly bleeds green and gold. She has decided to pursue her teaching certification, and is in the process of determining where she will obtain her Master’s degree. Corey will be returning for his 18th “official” summer at Camp Echo Lake (he was only 1 month old during his first summer). During the year, Corey is a high school history teacher and head boy’s varsity basketball at Hyde School in Maine. This will be Corey’s second summer at the LIT Director, and he is looking forward to guiding a group of campers that he knows very well. Working alongside his parents (Glenn and Terry), and his sister, Ally, Corey is looking forward to “Bringing The Juice” every Sunday while cheering for both the Iroquois and the Mohawks. Be sure to check back next week, when we introduce you to the Summer of 2015 Programming Head Staff on The Trail.